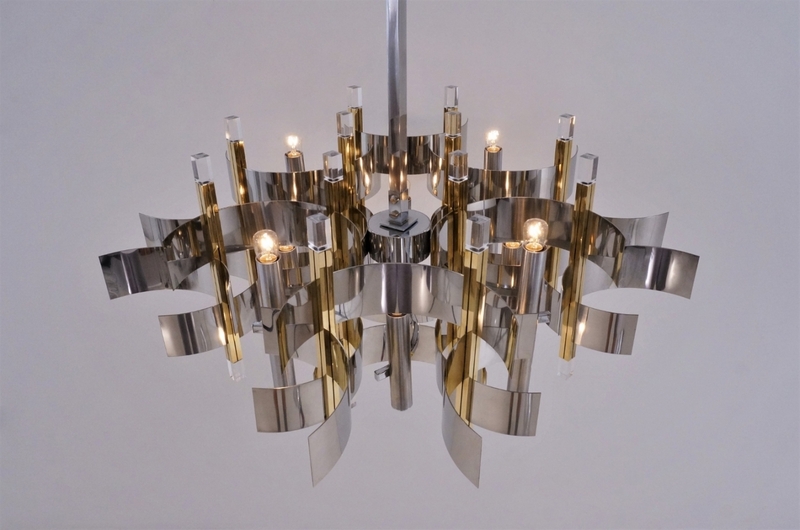 Sciolari chandelier `Futura` series, 12 lights on a frame made of brass, chrome & Lucite, 1976, Italian.This design by Gaetano Sciolari was featured in the 1976 Lightolier catalogue, as in the last photograph.This chandelier has been thoroughly cleaned while respecting the vintage patina. It is newly rewired, earthed, PAT tested, in full working order & ready to install. Light bulbs included. It is possible to install this light in other countries although it may be necessary to purchase different light bulbs suitable to local electricity. It can be used with a dimmer. 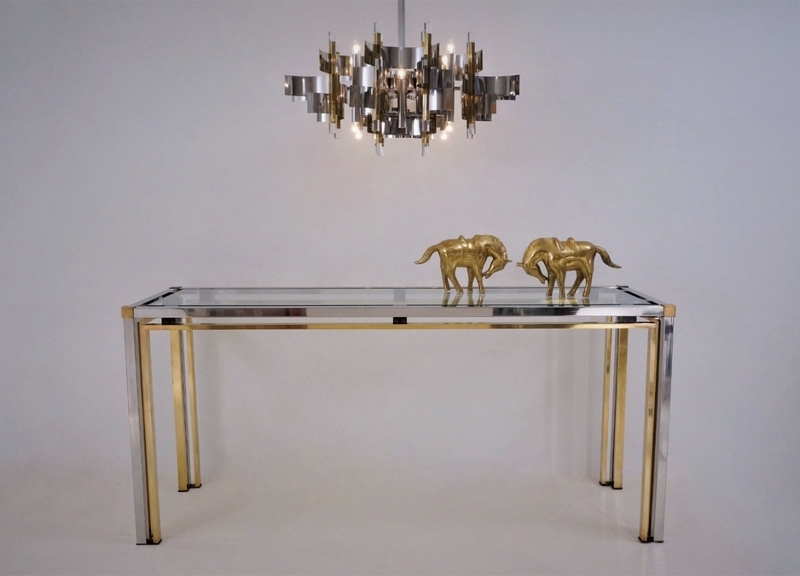 This original vintage piece by Gaetano Sciolari is a puzzled maze of imposingly futuristic curves & cuboids. 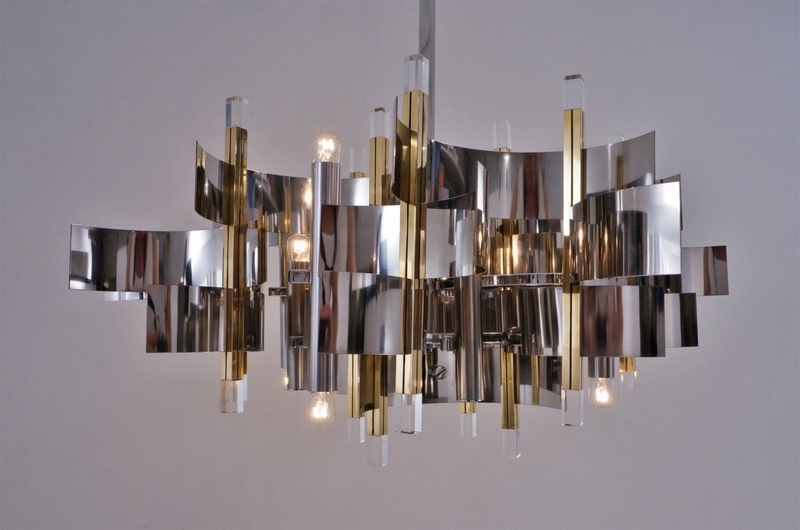 The clever combination of mixed metals & finishes, along with the clear Lucite tips that reflect, glow & magnify the light, make this chandelier not only a light, but an illuminated sculpture. This is a rare and stunning piece by one of the most distinguished ateliers of the period. 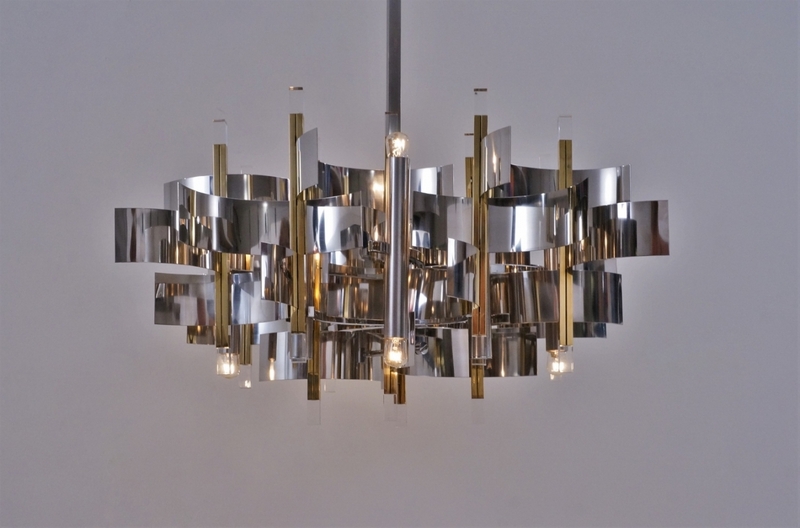 With its dynamic form and contrasting metallic tones, this fixture would be a winning addition to a range of of Interiors such as Mid-Century Modern, Art Deco, Hollywood Regency, Brutalist, 70`s Glamour, Post Modern, Industrial or Contemporary. The mind is drawn to understand the network of polished chrome arcs connected at vertical brass pillars, each finished with a Lucite end. This labyrinth is an outer decoration for what lays inside: 8 brushed chrome tubular lamp holders interconnected by polished chrome arcs. There are 12 lights in total: 8 facing upwards and 4 downwards. Structurally, the main frame is composed by a polished chrome cylinder compartment from which radiate 4 arms. These are square section polished chrome arching arms. All 4 curve outwards and interlock to the main tubular vertical frame. Each of the upper longer arms finished with a tubular column as candle cover. Inside there are the lamp holders for a total of 8 lights. The top row has 4 uplighters & 4 downlighter. Further down the frame, there are the two shorter arched arms. At each end these carry an uplighter making 4 on the bottom row. These are slightly shorter than the upper row. They are also finished at the bottom with a round decorative polished chrome plate. All the 8 tubular candle covers that carry the lamp holders are in brushed chrome plated brass. In total there are 12 lamp holders. Each carries an (E14) small screw standard light bulb up to 40 Watts each. Presently fitted & photographed with clear Pygmy shaped light bulbs of 25 Watts, which are included in this price. It would be possible to use any other E14 shaped bulbs such as candle shape or golf shape to create a different look. There are two main internal chrome bands attached to the tubular polished chrome main frame by a decorative chrome nut. The rest of the chrome banding interlocks and slides through the vertical brass cuboid rods into position creating an interlocking sculptural pattern. 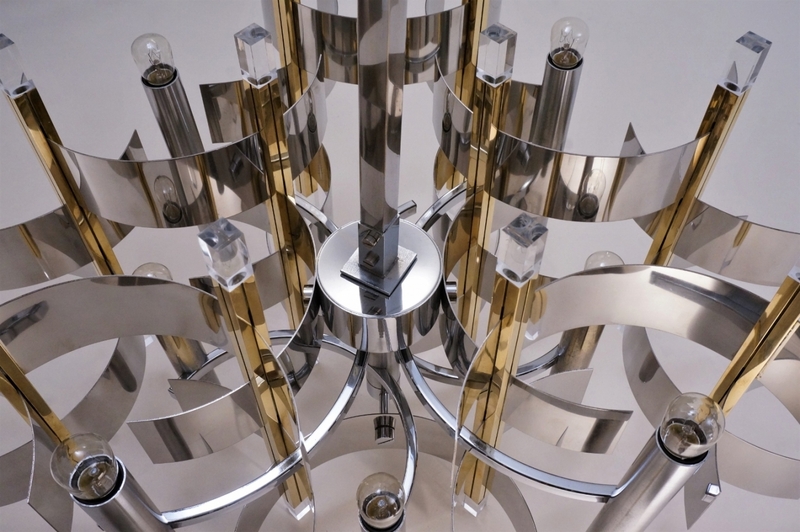 At the very bottom of the frame, the main column is finished with a section in polished chrome with 2 short tubular arms connected by 2 decorative chrome nuts to the main frame and interlocking the flat chrome bands to complete the design. Rising from the central cylinder is the pendant bar; a tube with square profile finished in polished chrome. 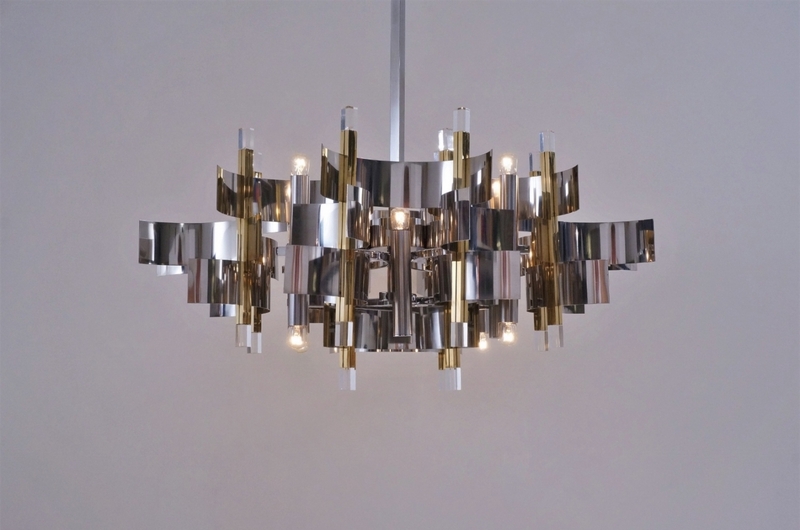 The chandelier attaches to the ceiling via a rectangular polished rod with a robust embellishment in a mirroring rectangular form at its base that connects to a circular canopy. 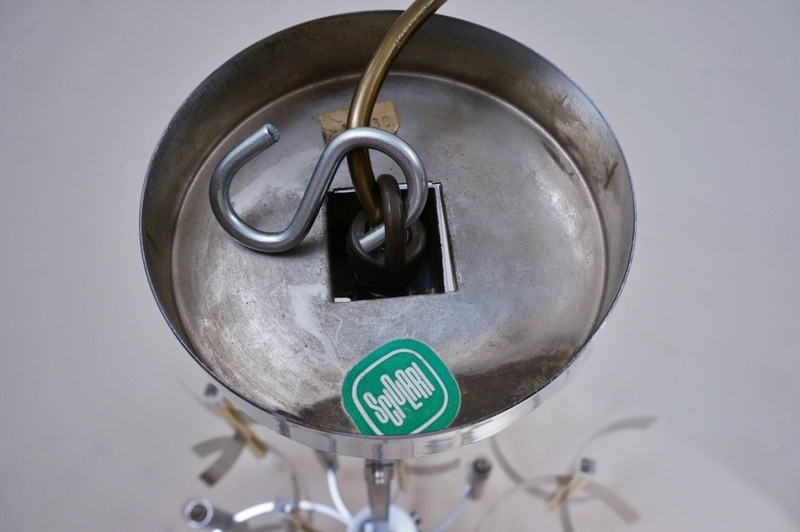 This rises and finishes in 3 parts: a round polished chrome ceiling cup, a cuboid attachment holding the ceiling cup in place, and inside, a ring with a removable S hook for hanging. The cuboid attachment is particular interesting as it is fitted with lateral spring loaded ball bearings which allows the ceiling cup to be fit to the ceiling. The length of the pendant rod is divided in 2 portions with a connector. It could be shortened if needed. There are also solutions to lengthen the drop of this chandelier. At the junction of the pendant rod and the main frame there is a similar chrome cuboid. This allows the rod to be leveled when fitted in place. This vintage chandelier is in excellent condition. The chrome surfaces are smooth and in very good condition, with no marks or scratches. There is only minor rubbing to the brushed chrome candle covers in some places adding character. The Lucite end surfaces are all in perfect condition with no losses or chips. The original Sciolari paper maker`s label is inside the ceiling cup. Packing is offered free of charge. We take special professional care while packing. For safe transport the structure would be wrapped in segments and supported. It would fit nicely into a box for posting/shipping. Additional dimensions: The pendant rod alone is Height: 70 cm, with a junction at Height 42.5 cm, allowing to be divided if needed. The sculptural part of the chandelier frame without the bar is: Height: 36 cm & Diameter 75 cm.GAETANO SCIOLARI BIOGRAPHYWhile Sciolari Lighting has been around since 1892, it was their most famous offspring Gaetano Sciolari who went on to design for Italian manufacturer Stilnovo in the 1950`s. 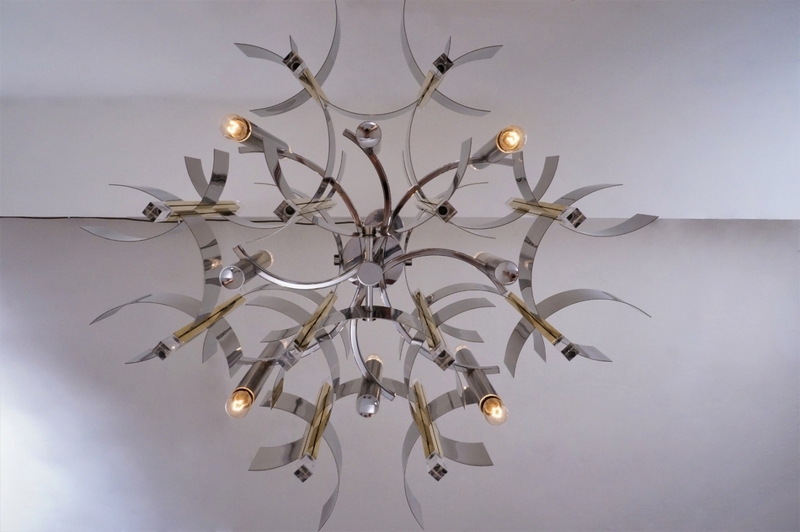 Read more on our Roomscape Blog about Gaetano Sciolari Lighting.